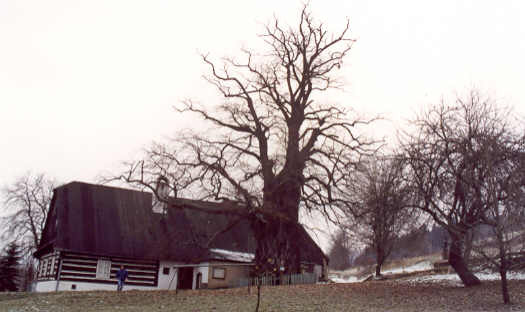 On a very cold day in november 1999 Jeroen Pater and I visited this old Lime-tree , standing near a farm in the hills in the north of the Chech Republic. A strange tree it is: an enormous big, hollow trunk, ending abrubtly at about 2 m ( 5 - 8 feet) to give way to a bunch of branches. A legend says that once a boy fell into the hollow trunk and died. Since then the tree is haunted by a ghost. To protect the tree against rain a roof is build above the hollow trunk. 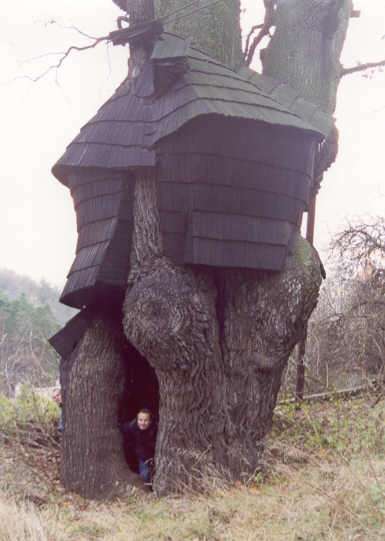 In one side a door is made in the trunk: so a small house is made ! Near the ground the circumference is 12,3 m ( 40 � feet); this was only 9 m ( 30 feet ) in the end of the 19th century: probably this Lime is not much older than 400 years. Most old Limes in the Chech Republic like in Germany stand in villages near the church or a farm, as in this case. Most ancient limes have lost their original crown and parts of the trunk, either by pollarding or destroyed by a storm. 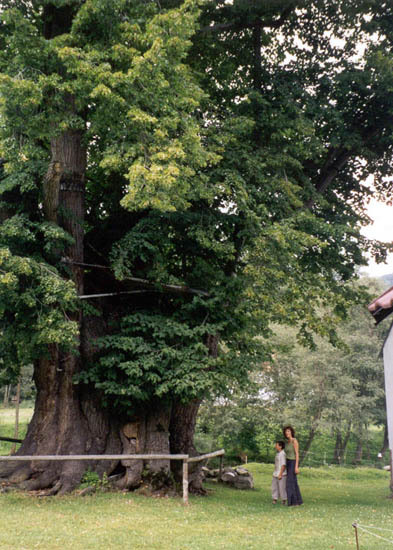 This one in a small village in Chechia is one of the rare specimens wich still have the whole trunk as well as the original crown. 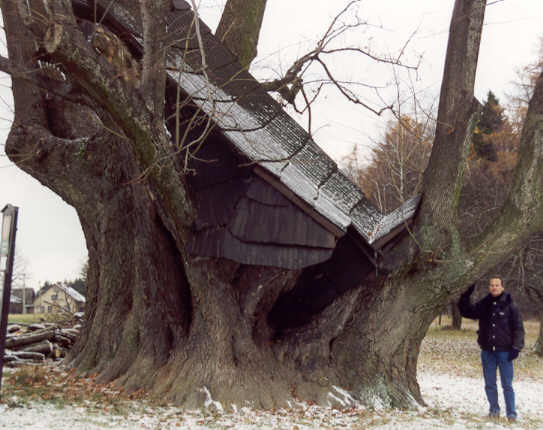 The huge trunk is hollow, has a circumference of 11,2 m ( 37 feet ) and a story connected to it: a farmer in the past was member of a forbidden church-association. To copy secret psalms he crept in the trunk with the aid of a ladder and to pass the time he sung while writing ! The age of the Lime is not known, but 600 to 700 years seems reasonable. 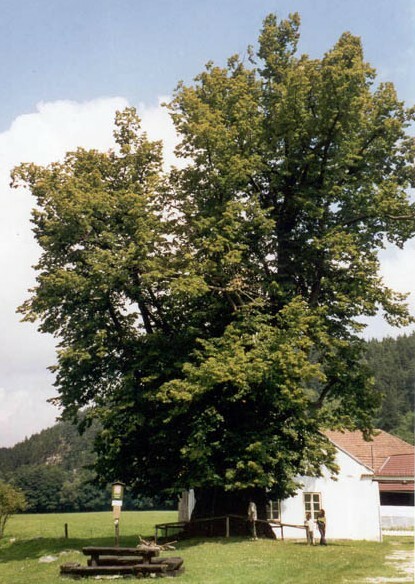 Another huge Lime tree can be found in the south of the Chech republic, in the village Sudslavice, near the Bohemian Mountains. It stands near an old watermill along the river Volynka and is the largest Lime of the south of the Country. 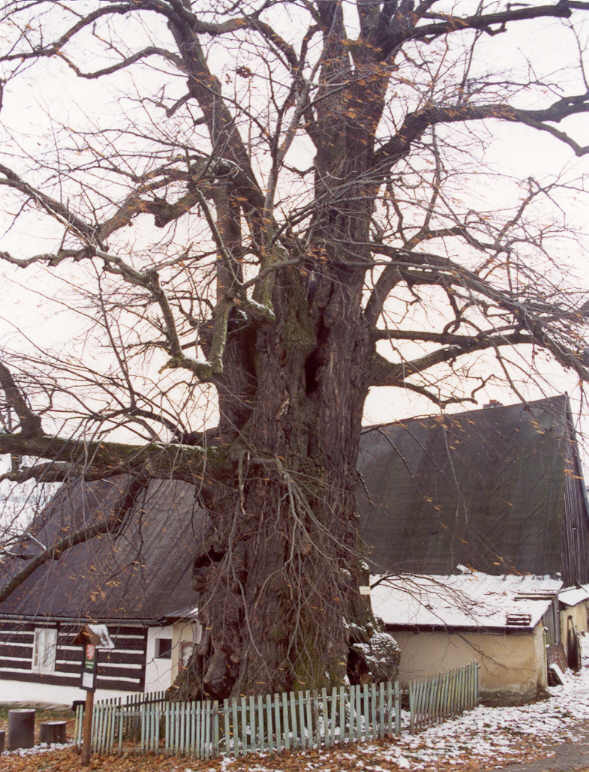 The Sudslavice Lime has a girth of 11,5 m (38 feet) and is said to be 600 years old. Sudslavice can be found a few miles north of Vimberk, at the outskirts of the beautiful Sumava National Park.